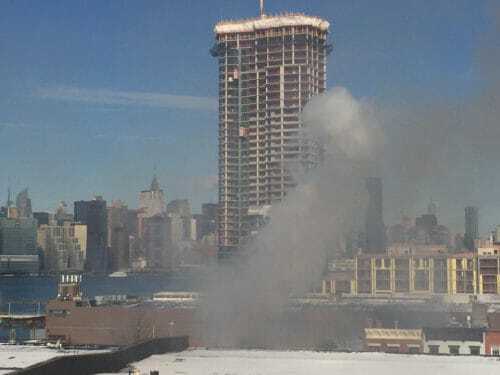 According to @NYCfirewire and local eyewitnesses, there’s a fire currently blazing at 13 Greenpoint Ave. on the 2nd floor in a 2-story commercial building. We’ll update this post as we hear more. “The affected building houses a high-end recording studio, The End. Twelve firetrucks and 65 firemen were on the scene around 10:05 a.m. after receiving the call a little after 10 a.m., an FDNY spokesperson told Patch. There were no injuries, and the cause of the fire was still under investigation, the FDNY spokesperson said. Email us at [email protected] if you have any tips or photos you’d like to share!